FILE - An individual watches from above as protestors march below during an anti-government protest in Managua, Nicaragua, Aug. 11, 2018. 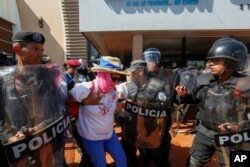 A judge on Monday gave lengthy prison terms to three farmers' leaders who participated in protests against President Daniel Ortega's government, citing them for terrorism and other alleged crimes that their defenders consider political and trumped-up. Julio Montenegro, defense lawyer for Medardo Mairena, said his client, who represented the opposition Civic Alliance in failed peace talks last year, received 216 years while Pedro Mena got 210 and Luis Orlando Pineda 159. Montenegro called Mairena's sentence "most exaggerated" — prosecutors had sought far lesser sentences of 73 years for Mairena and 30 for Pineda. "He is an inquisitor," Montenegro said of the judge responsible for the sentences. Nicaraguan law caps prison time actually served at 30 years, however. The three men are leaders of a rural movement opposed to an inter-oceanic canal that the Ortega government proposed to build with Chinese help as a rival to the Panama Canal, a project that has gone nowhere four years after a symbolic ground-breaking. After protests erupted last spring that broadened to include demands for Ortega's exit from office, Mairena, Mena, Pineda and others organized roadblocks in the country's interior in support. Authorities accused them and others of promoting a "failed coup" against the government of Ortega, a 73-year-old former guerrilla leader who was first in power from 1985 to 1990 and returned to the presidency in 2007. Since then, critics say, he has consolidated a vice-like grip on power and governed in an increasingly authoritarian manner, including a crackdown on the 2018 protests by security forces and armed pro-government civilian militias in which more than 300 people were killed. FILE - A masked anti-government protester is arrested by police as security forces disrupt an opposition march, coined "United for Freedom," in Managua, Oct. 14, 2018. Mairena was sentenced on seven charges including "terrorism" and for the death of four police officers and a civilian during the unrest. The sentences came two days after the government expressed a willingness to restart last year's talks "for the good of the country," according to an official statement released Saturday after Ortega met with private business people about the matter. Many opposition figures have said there must be preconditions for any dialogue such as the release of some 770 "political prisoners," a halt to what they describe as police and paramilitary "repression," and guarantees for freedom of expression.